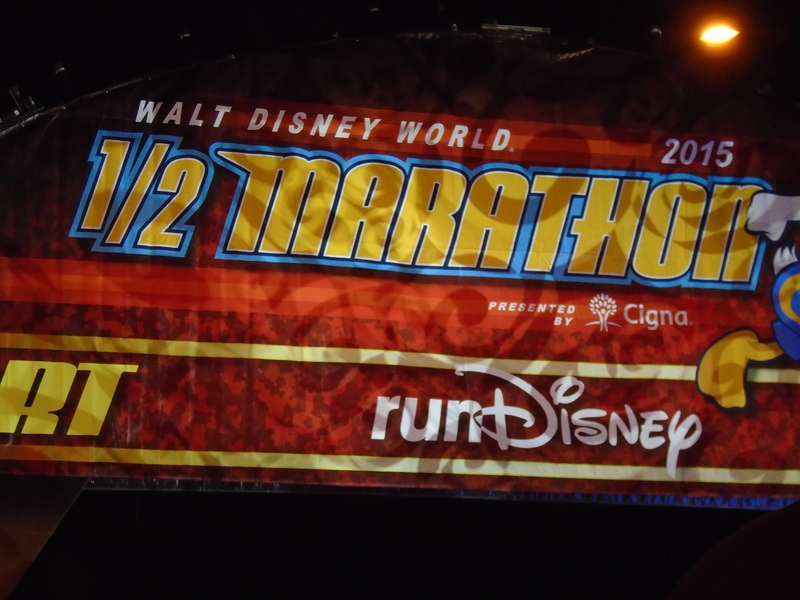 Walt Disney World Marathon Weekend!!! First of all…you’re probably thinking “Hey! This is not in the correct order!” and you are absolutely correct. Also, this is likely going to be a two-parter cause the timing is pretty expanded!! If you were there, you know!! 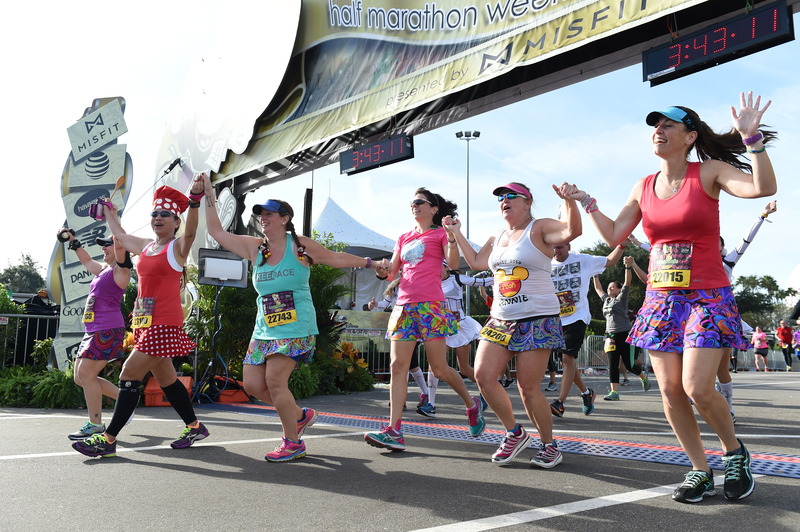 But first, take a trip with me back to January…and let’s go to Walt Disney World for Marathon weekend where I was all set to run a 5K and a half marathon and hang out with my awesome Disney Ohana. 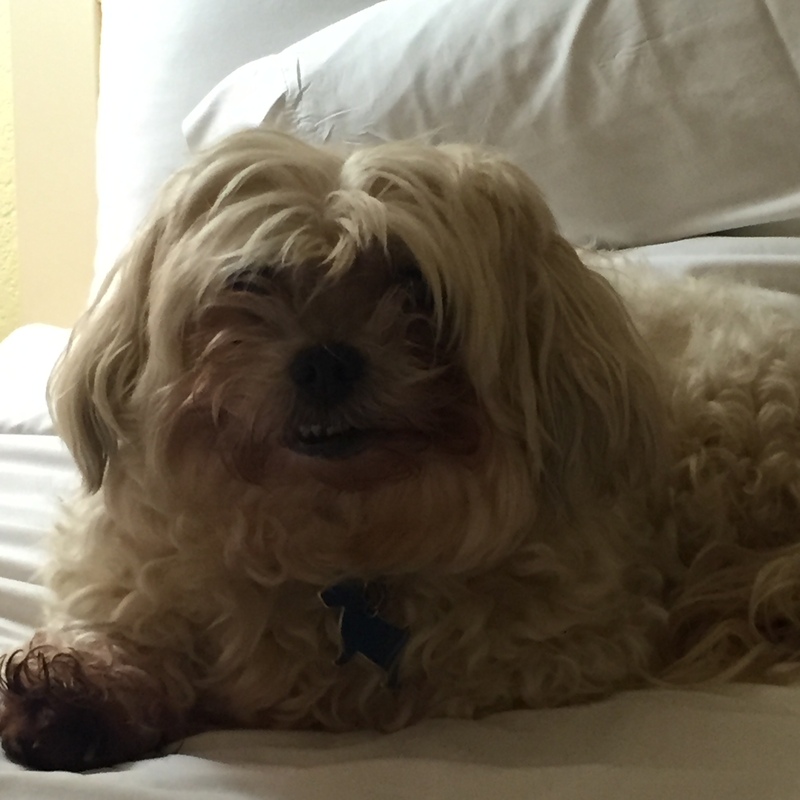 This trip involved a couple of travel plan changes but eventually it was all straightened out and me and the Phred got to Orlando Tuesday morning and after some confusion I found where I had to pick up my rental car and was on my way! Eventually I made it to Celebration and was able to relax. Or…get to work since I had work to do! 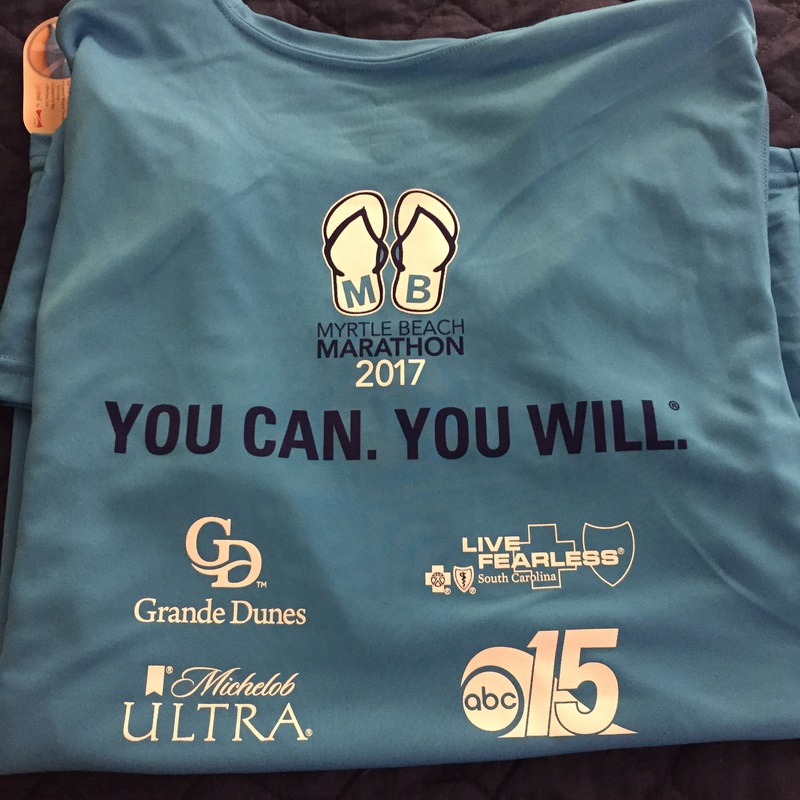 As we were running the 5K on Thursday – and I was volunteering on Friday – we would have to brave the expo on Wednesday to pick up bibs and shirts and credentials. I drove in the red Kia that I had rented (it’s the one in the hamster/rat/gerbil commercial!) 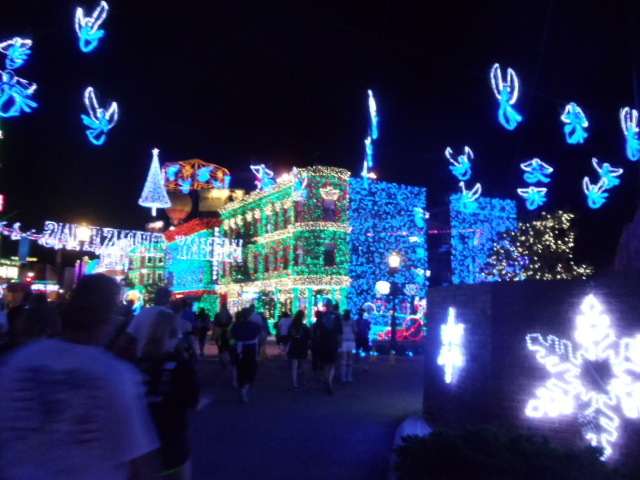 and we blasted …um Christmas music on our way to ESPN Wide World of Sports. The Disney expos have been come a bit of a cluster in the last few years…seems like way too many people in one place at one time! 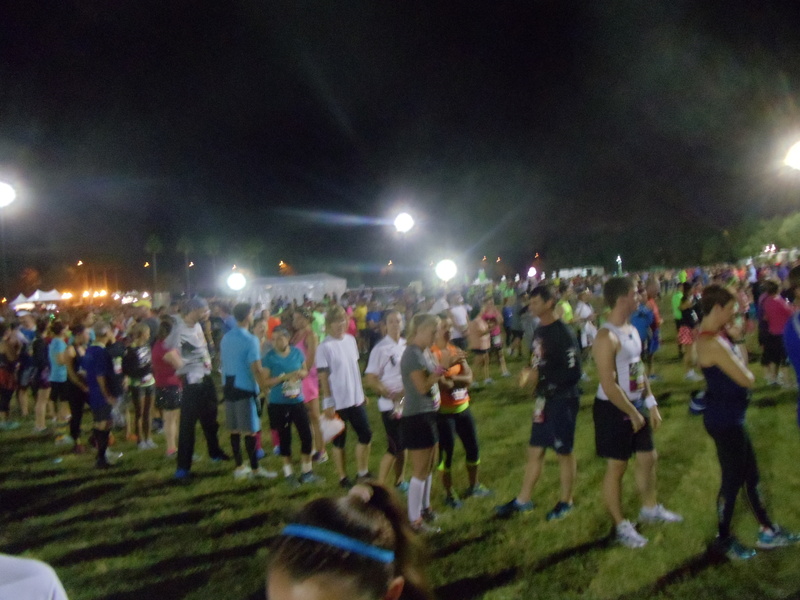 Fortunately, the building for picking up bibs was not too crowded and the 5K shirts were out in the stadium. Don’t even ask about picking up the other shirt – that building had a massive line to get in so we decided to pick up the Half Marathon shirt after the half on Saturday figuring the crowds would really have died down! Then I had to hunt down where to pick up my volunteer credentials. After getting mis-directed SEVERAL times I finally found the door to go in and grabbed my things! 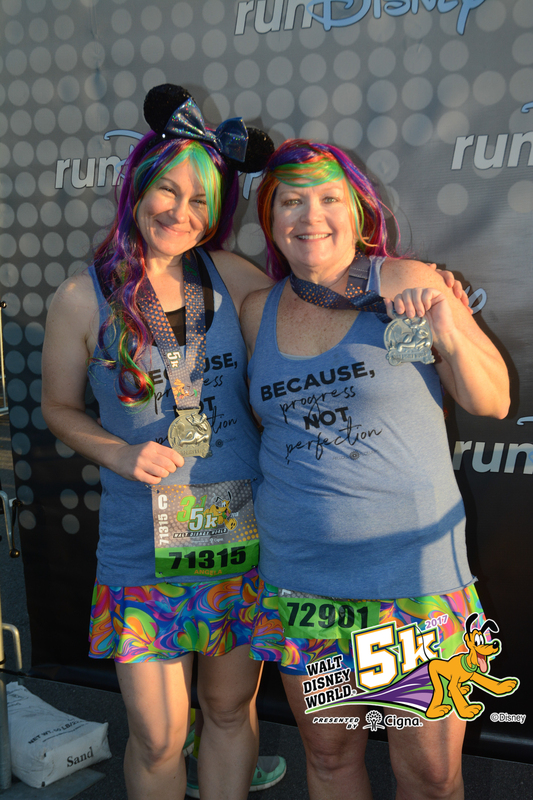 The plan for the 5K was to run as a group – we had gotten some awesome wigs and we had matching skirts (not my favorite Skirt Sports but we’ll call it Brand X). Angela and I had Fellow Flower tanks -“Progress Not Perfection” since this is something I need to remember! As usual I was in a farther back corral than my friends. Happily, for me, Vanessa and Angela dropped back to start out with me. As we got into EPCOT we were joined by a couple of others and eventually, while waiting in line for a picture, we gathered our whole group for an amazing rainbow finish!! 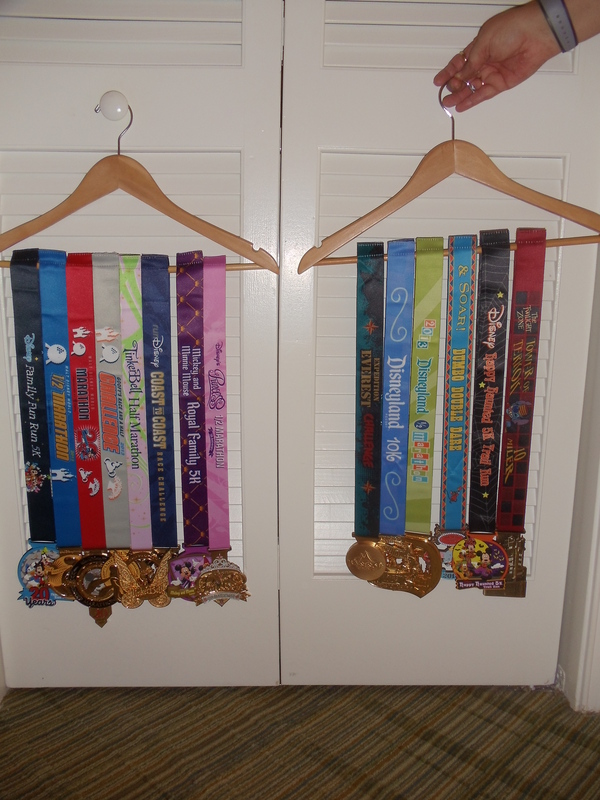 Since Disney races are early enough, I had time to do a little work after my shower and before we headed over to the Grand Floridian for afternoon tea with the ladies! 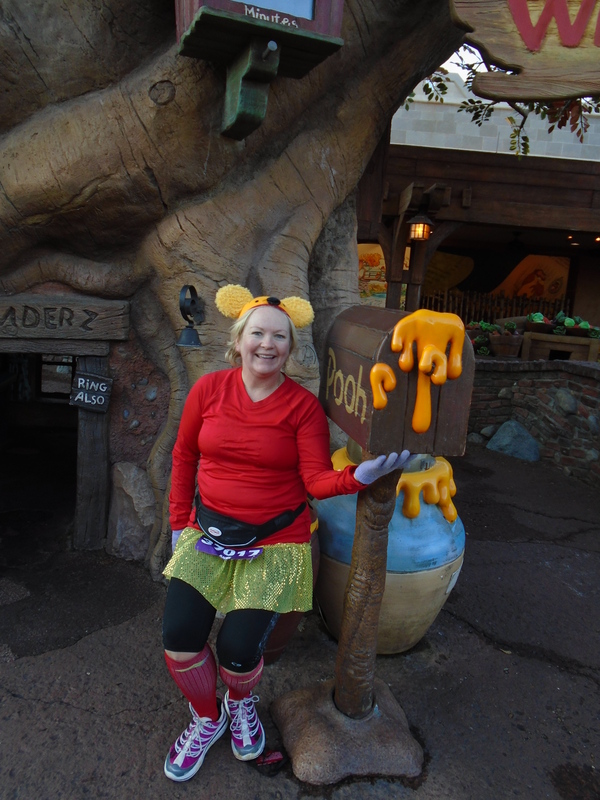 I do love volunteering at Disney — it’s always easy to find the fun and the magic! 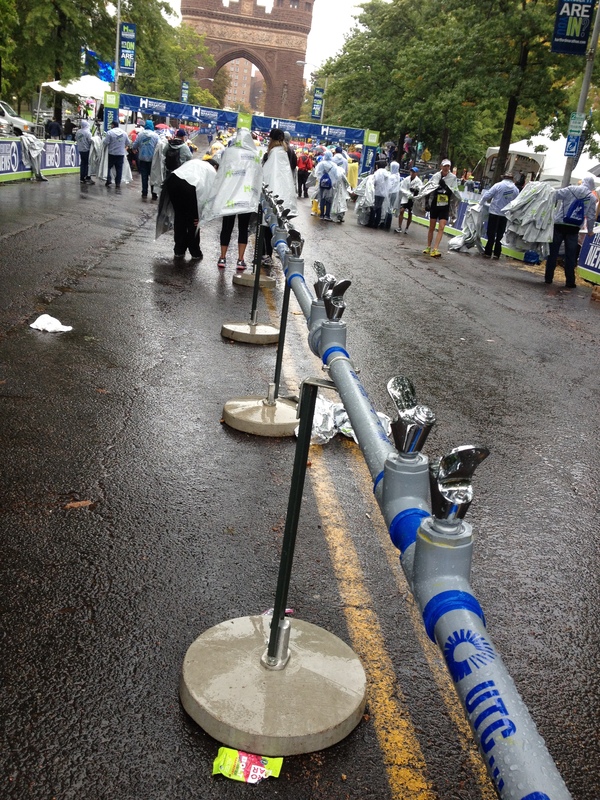 For this race, I was one of the people leading the corral to the start line. While waiting I met an internet friend, possibly for the first time. Also, watching the faster corrals go past I noticed that not too many of them seemed to be in a very magical mood…More like a dwarves – lots of Grumpy faces! The further back in the race, the more Happy people we saw! Naturally all of them were pretty Sleepy! Anyway….after getting my group to the start I decide to wait to see more of my friends off. One of the volunteers standing next to me said “wow, you sure know a lot of people!” And I do! Some pretty awesome people! After all of the runners had left the corrals and were approaching the start, I headed to the meeting area for our group. As I was walking about 3 or 4 runners came speeding past to get into the lines to start – it was a close call for one of them!! We got released early, I headed home for a couple of conference calls and then decided to head over to the parks. 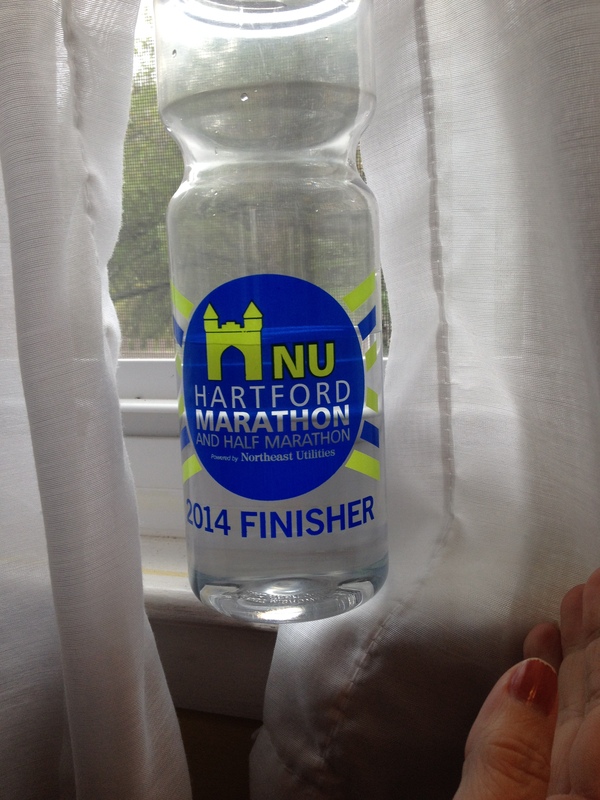 Now, it had been threatening to rain for our Half Marathon on Saturday but the race was “rain or shine”. It isn’t like we haven’t run in the rain before, right?! But…around 5 or so in the evening, people staying onsite started seeing signs go up in the hotel lobbies that the race was being delayed…Okay. But I bet we still need to be there at Dark O’clock. I continued my trip around the Magic Kingdom, texting and checking social media for updates. And then it happened. Cancelled. Seems that there were thunder and lightning expected around the times that volunteers would be setting up and runners arriving and this is no bueno. Way too dangerous and no where to put 20,000 people if things got bad. 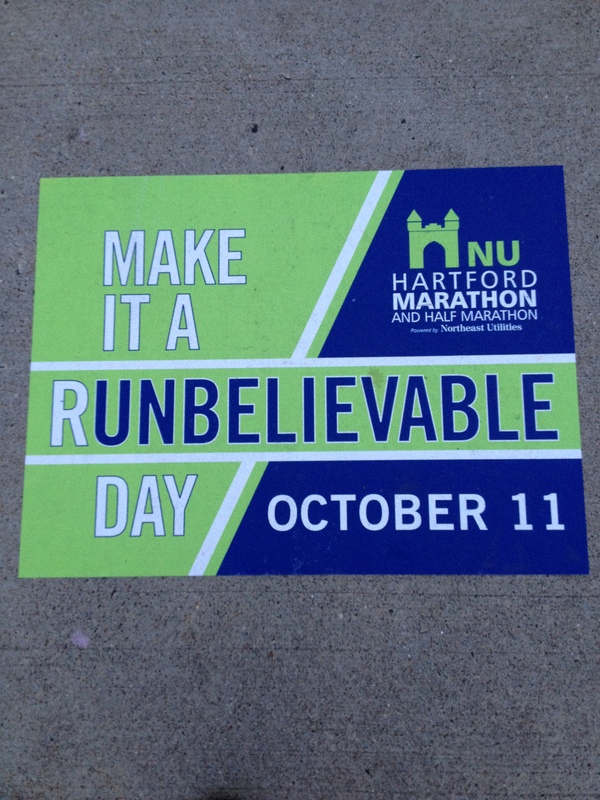 I actually did *not* do my half that day. I had gone to bed with a decent head cold so given the opportunity to NOT run in the rain…I took it. Of course, had the official race gone on I would’ve been out there making myself sicker! 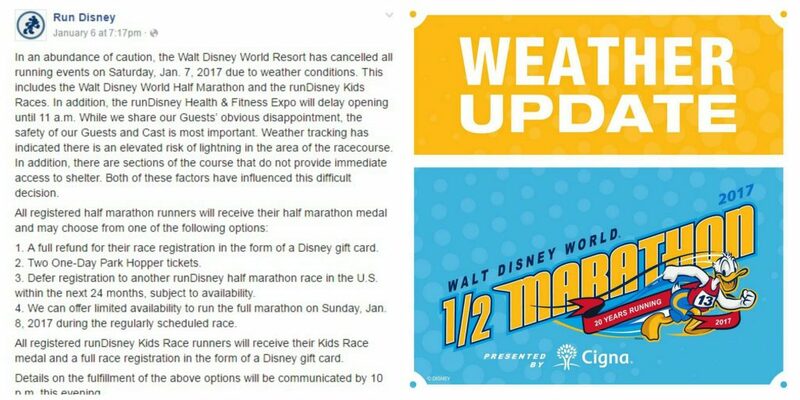 I should add here — runDisney took the fairly unprecedented action and actually offered refunds in various forms to those running the half. Which. They did NOT have to do. Rarely does this happen. 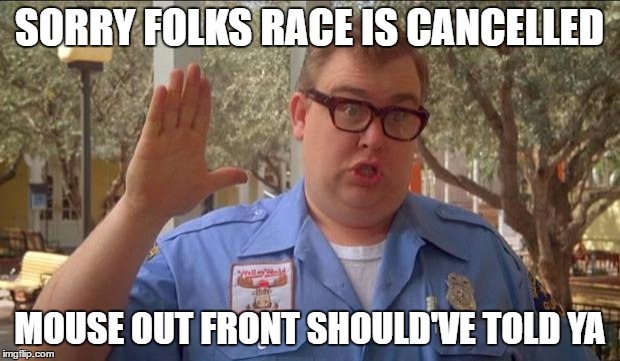 I’ve personally had 2 races cancelled (one at the very last minute like this one) and got nothing. So… ps – I took the cash – as you should know I would. Last week’s training did not go as planned or hoped. But I’m not beating myself up about it because all around it was a good week for me and I accomplished a lot – a lot of not running!!! I’m not going to go day by day to tell you what I didn’t do. Instead I will tell you what I *did* do!! 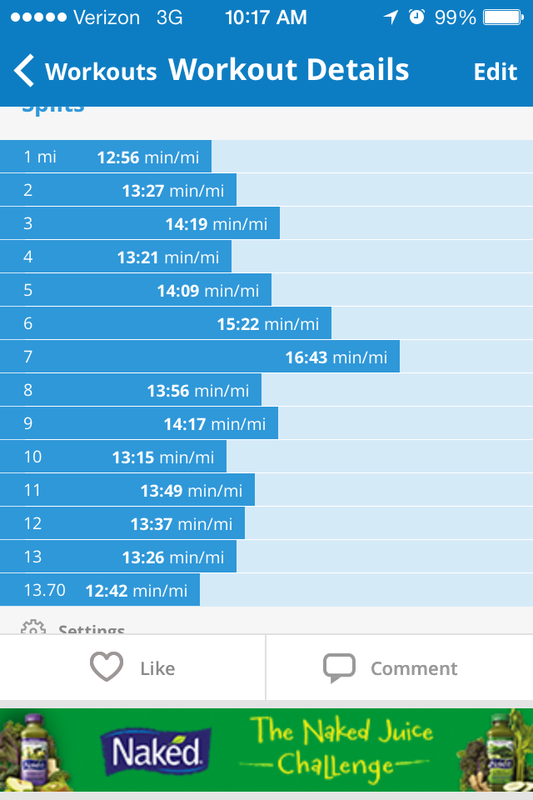 Saturday – I ran 11 outside. That’s right. 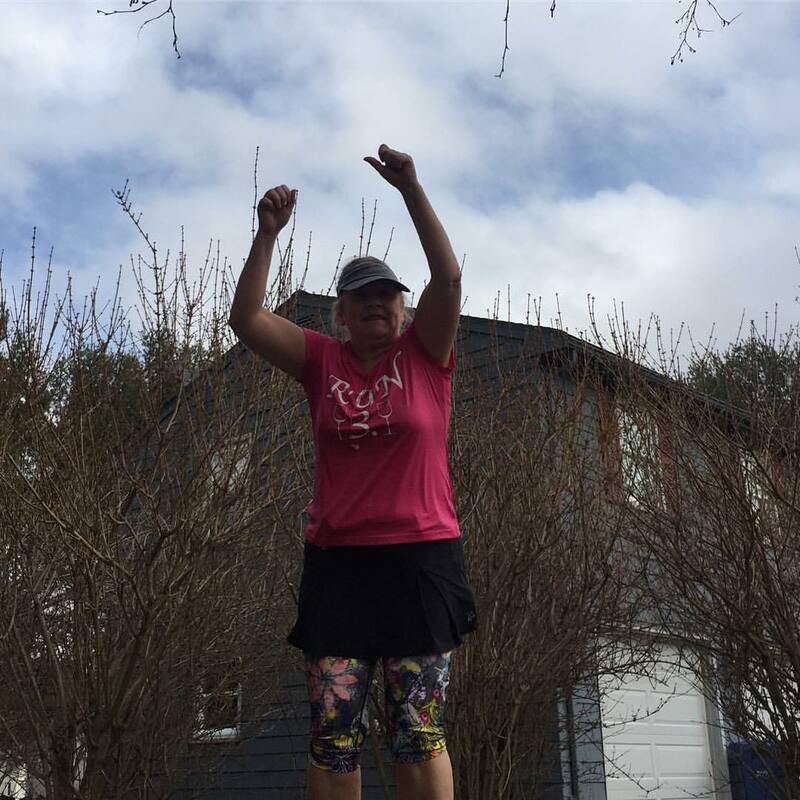 Short sleeves and capris the last weekend of February – in New England! It was gorgeous. 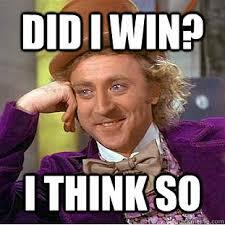 And, if we know anything we know I hate hills and tend to walk up them. But Saturday, in the first 6 miles I ran up most of the hills I usually walk. 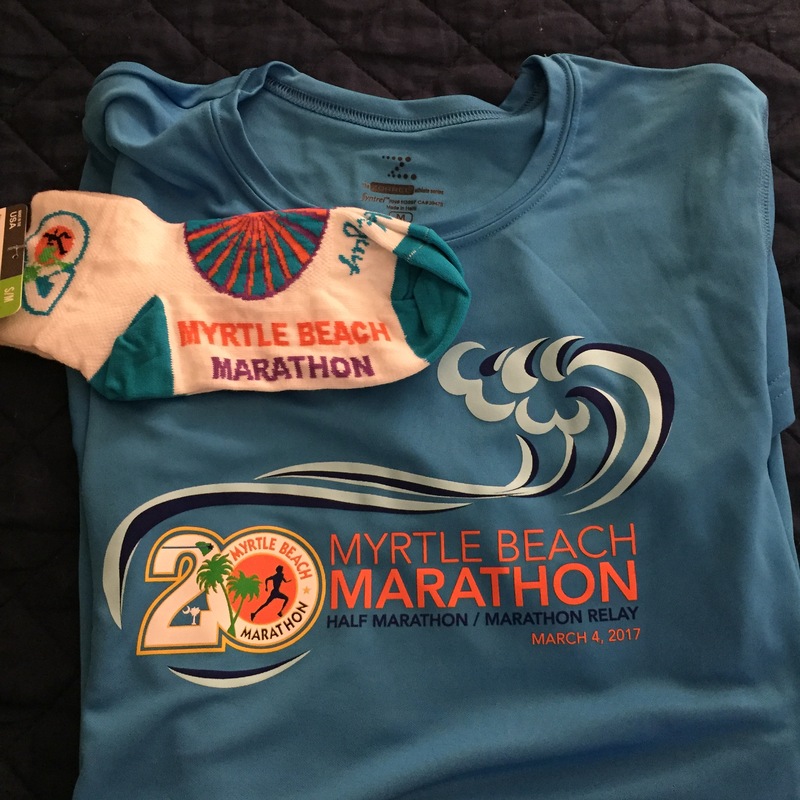 This coming week – short training week cause the Myrtle Beach Half Marathon is on SATURDAY!!! 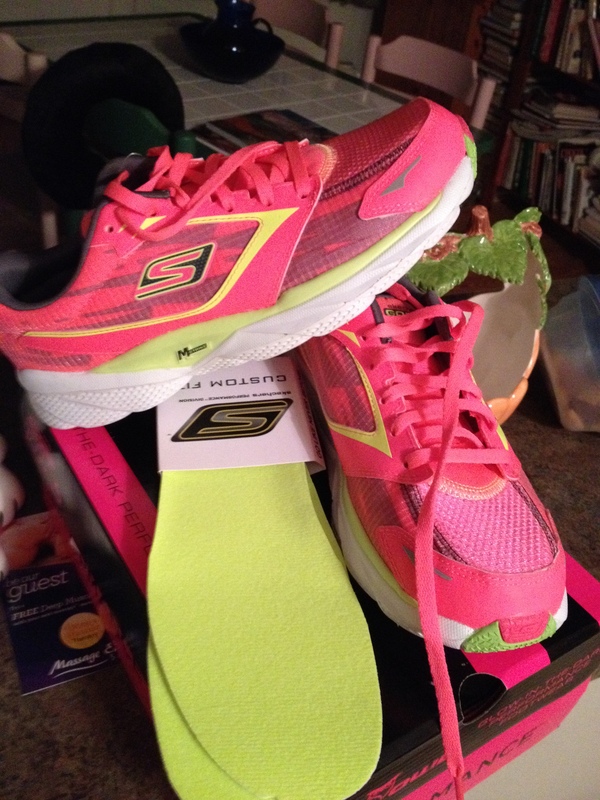 I’m pretty excited about this – it’s a new race for me and I love the beach. I will probably regret not staying down there longer but it isn’t like I can’t go back, right?!! So I will do what I can this week but at this point, isn’t all up to relying on what I know I can do and having a good time!?! Oh yeah! 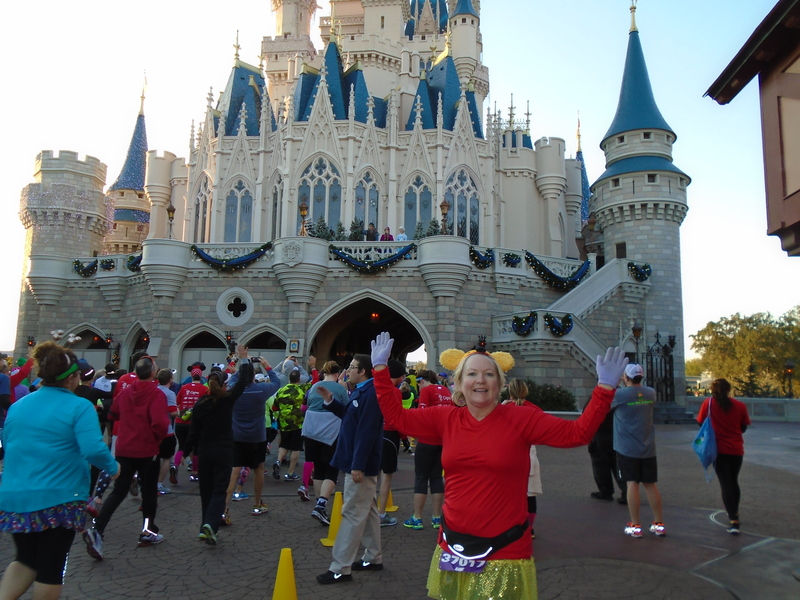 We finished the 10K, we went to the Magic Kingdom for an epic ride on the Jingle Cruise then back to the resort for a sandwich and bed! 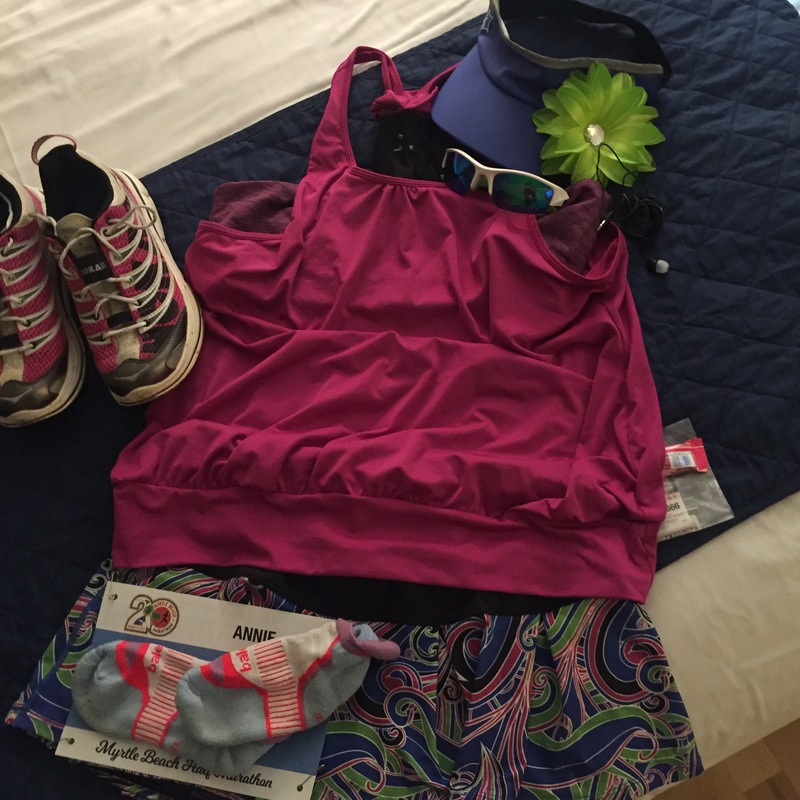 Now, normally, I’m a get all by things together the night before a race kind of girl. 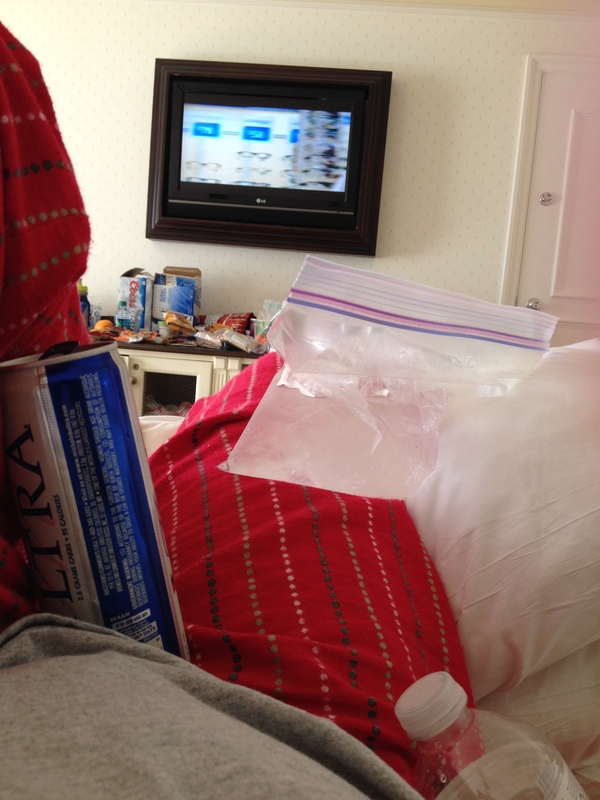 But…well, I was kind of winging it this weekend. 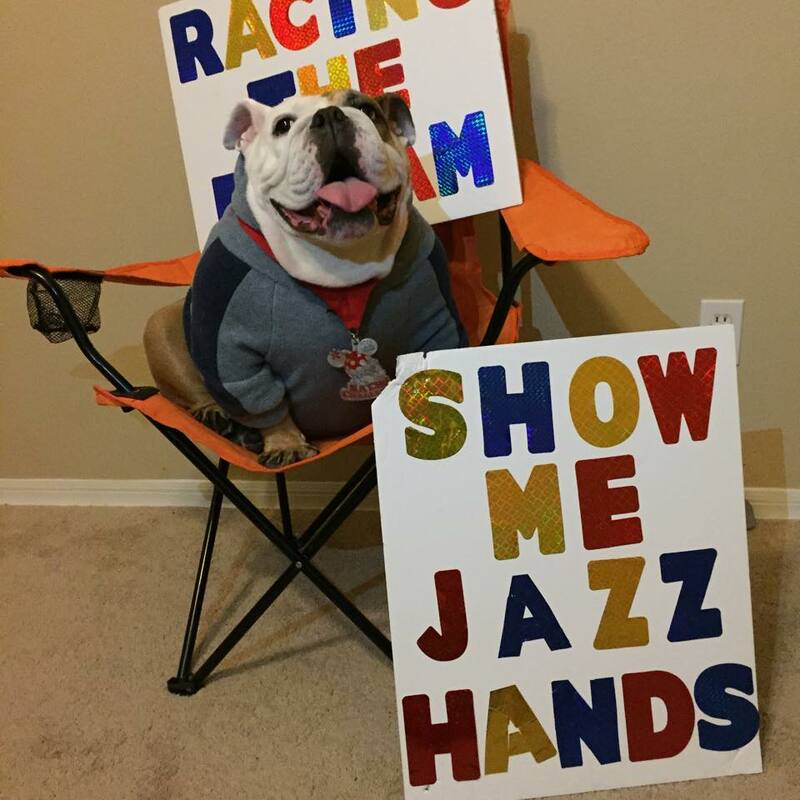 Na’Cho ready to take on the tough task of cheering on thousands of runners!! 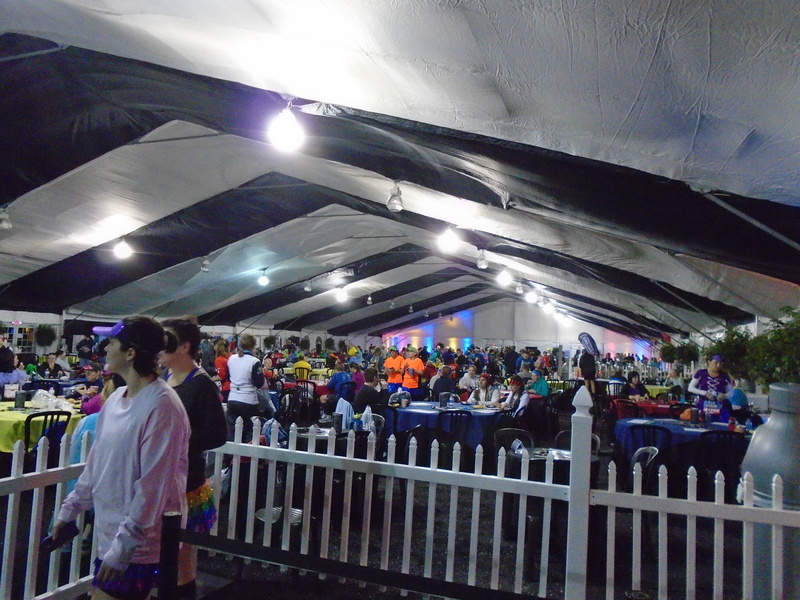 I set the alarm a bit earlier for Saturday – we had purchased the Race Retreat and I wanted to take advantage of the pre-race amenities: warm tent, bagels, fruit, coffee, water, private port-a-potties, and private bag check. Plus character photos!! Anyway…we got up, got dressed and headed to the bus. Because the weather was much cooler than I’d expected when I planned my outfits, I had to make an adjustment. 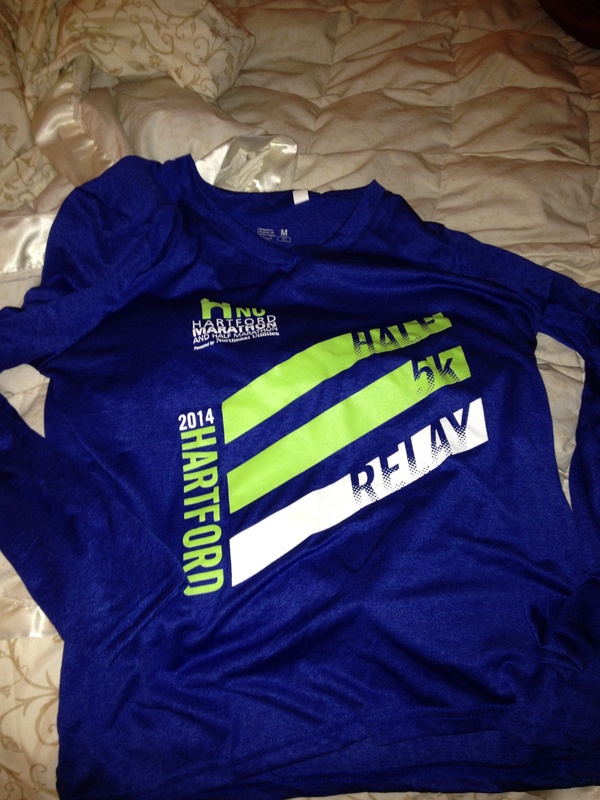 Unfortunately, that adjustment meant that I had to wear my race shirt. On the day of the race. Something I *never* do! To hopefully short-circuit any bad ju-ju, I wore it inside out! The line for the bus was a little longer on Saturday and I realized that we could hear the festivities from over in the EPCOT lots! 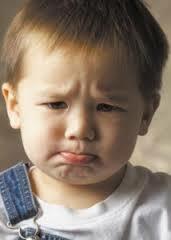 Hopped on that bus and really, as soon as we pulled away realized that I didn’t have my music with me…WHAT??!!! Oh well…that’ll learn me to “wing it” the night before a race, right?! You can really feel the excitement — even at 4 in the morning!! but I found a spot and settled in for a bit. Grabbed a bagel, some peanut butter, a banana and an orange. And a couple of bottles of water. And, of course a couple of pictures! What? 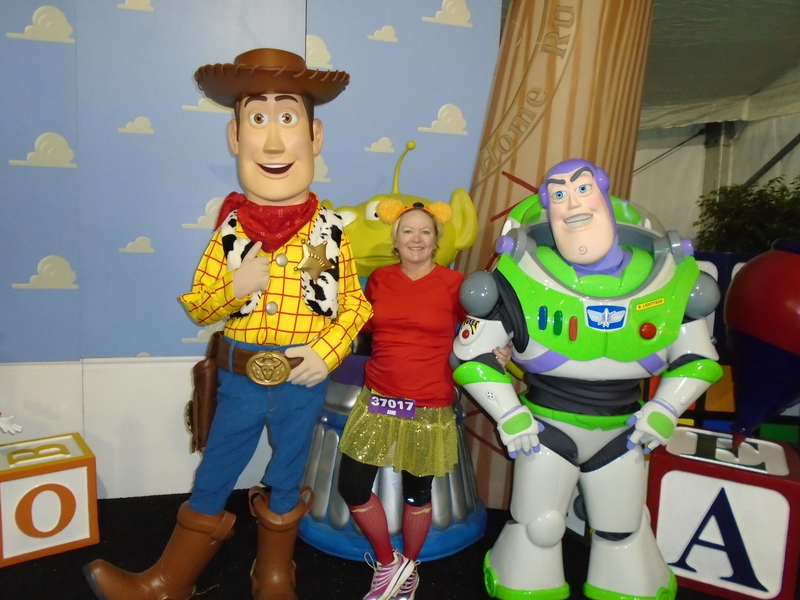 Oh just hangin’ with my pals Buzz and Woody! We were kind of anxious to get to the corrals – which was quite a walk. But first I was meeting up with my running group again for my dose of motivation before heading to the back of the pack…again. The group was even BIGGER today!!! Eventually (an hour later, actually) we were crossing the starting line and off on our 13.1 mile adventure! Without my music I really focused on the sights and sounds that Disney provides! And stopped for a picture or two!! Heading into the happy place!! I was going to have to walk through the castle anyway, so time for another stop! It’s been awhile since I’ve run at Disney on my own — and even though I didn’t have my usual companion to chat with along the way, the time still seemed to go by pretty fast! I was super happy to see these ladies when I came out of the Magic Kingdom! Thank you thank you thank you!!!!! And…cured my chocolate craving!! And I must say, except for those few miles through the castle and heading out of the Magic Kingdom, I did pretty darn good!! 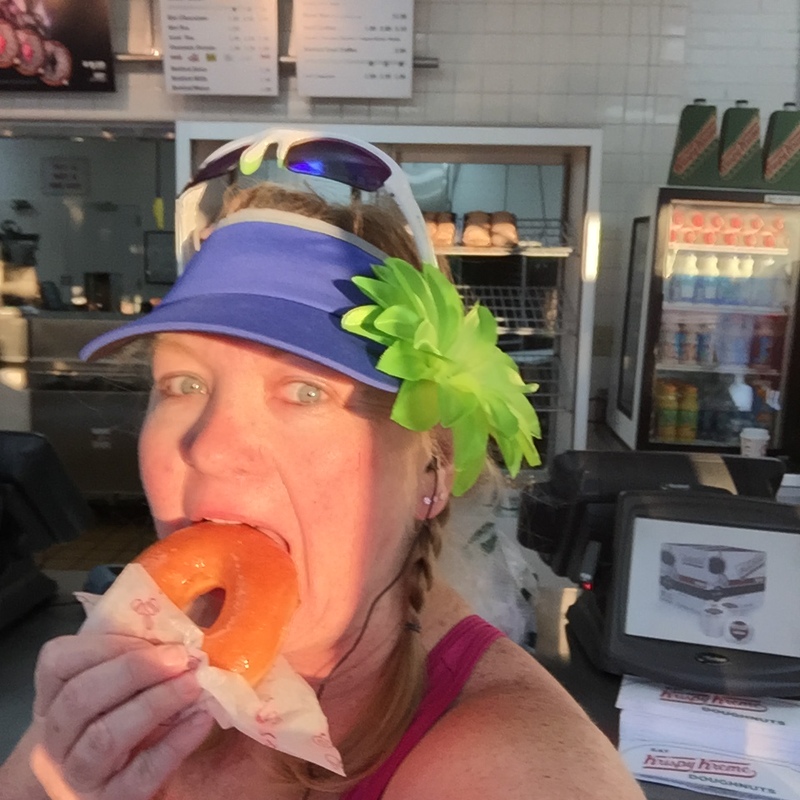 MIles 6 and 7 were through the castle and some tight roads…mile 9 was just…boredom!! 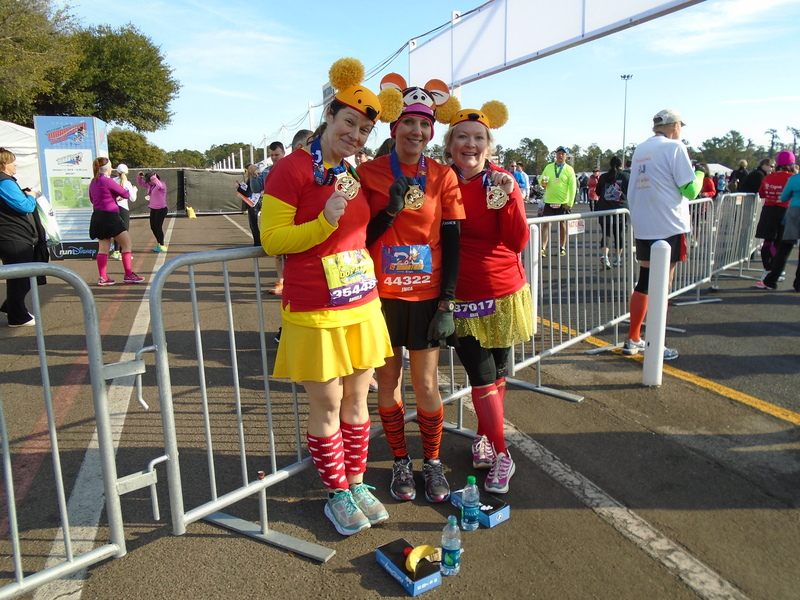 Post-race, I ran into our other Pooh — and Tigger Too!!! 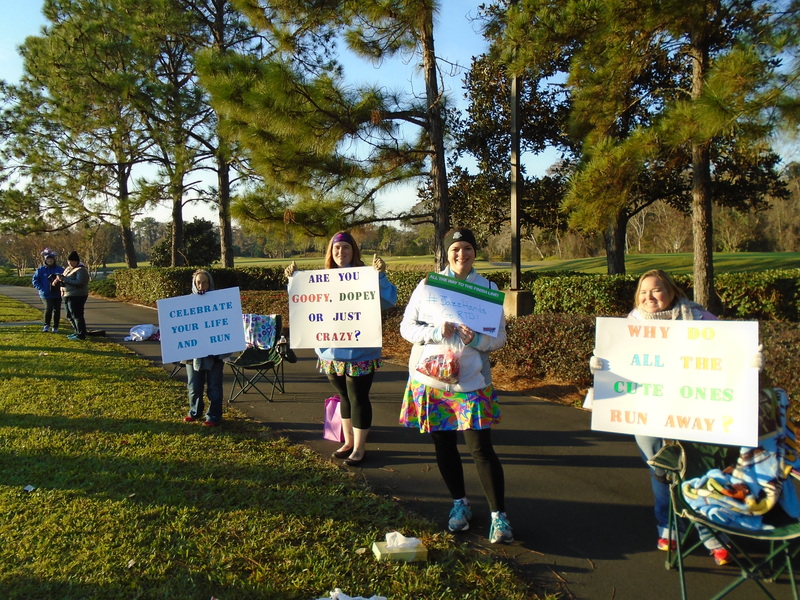 I was so happy to see my friends waiting after I finished!! Had to memorialize this!! 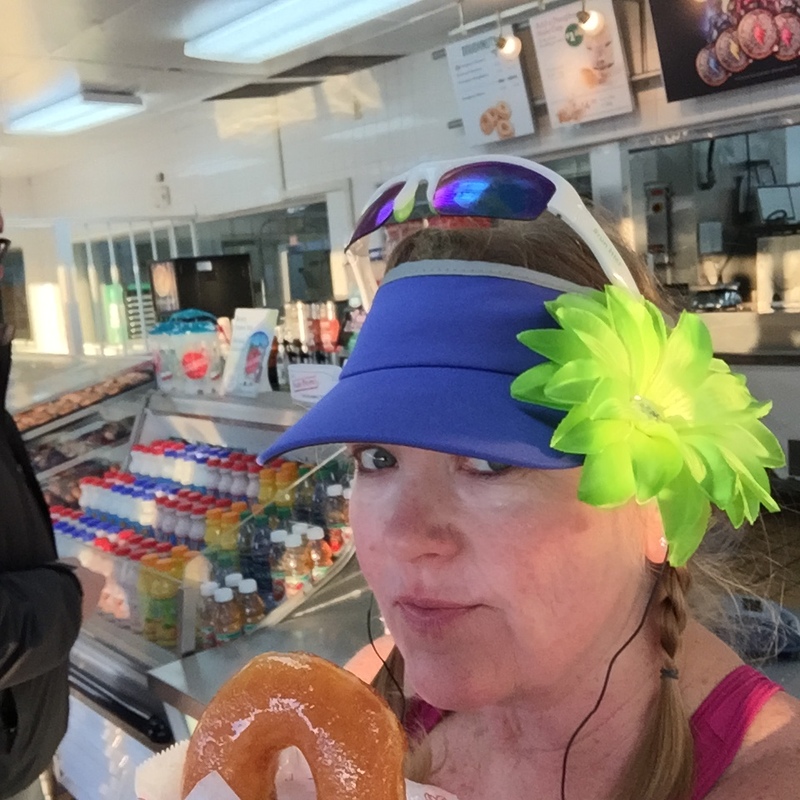 I somehow managed to miss Na’Cho on the course – I was looking at the wrong side of the road I guess 😦 So my plan was to go to the Retreat and grab breakfast number 2 and my gear bag and head out to pick up my Na’Cho medal (and of course hug the man of the hour!). Though while getting my things it turned out that the road had opened and Na’Cho headed home…. Three down and one more to go! It was actually looking like I was gonna pull this thing off!! 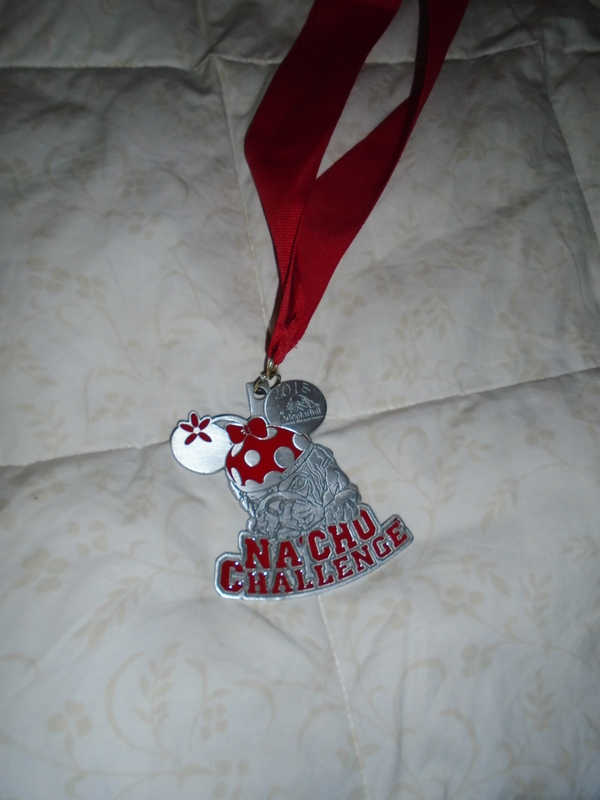 The super special Na’Cho Challenge medal! 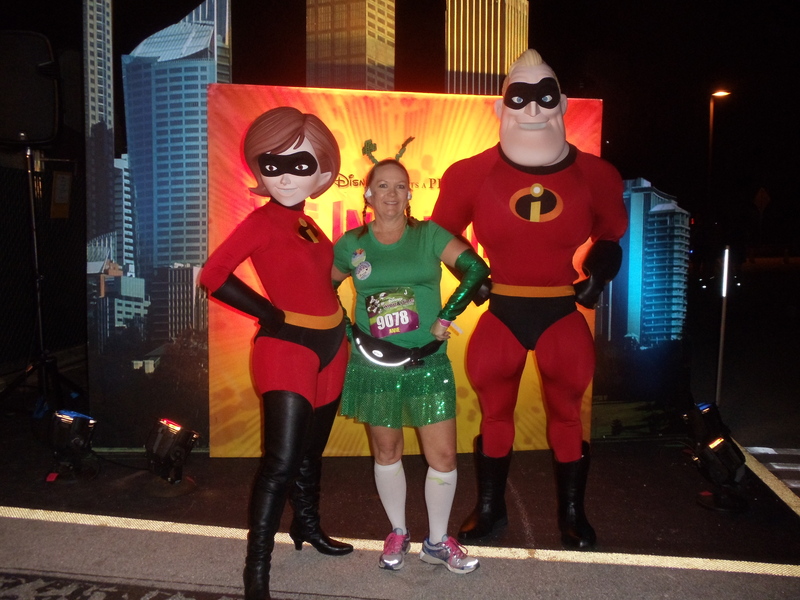 Wine and Dine Half – or How I Met the Balloon Ladies and Survived! So it was finally here! My Magical journey that started back in January was coming to an end. 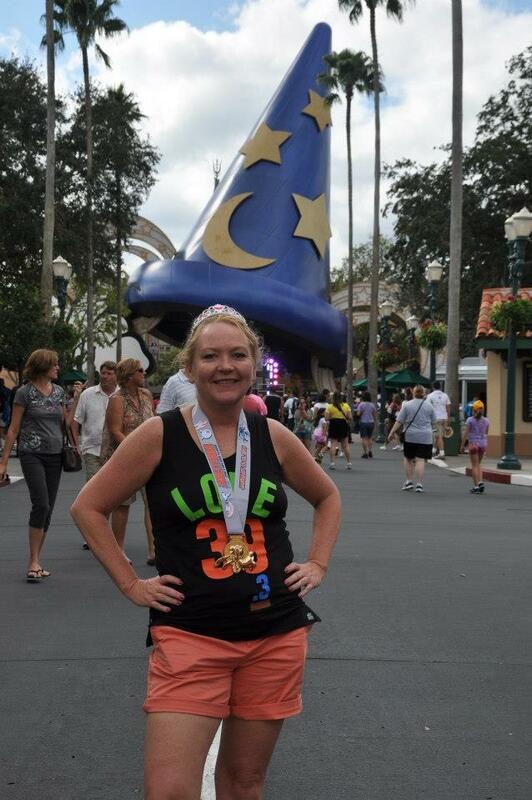 When I crossed the finish line, I will have completed 126.4 Magical Miles at seven runDisney events. 1 Full marathon, 1 10-Miler, 5 half-marathons, and 5 5K’s. 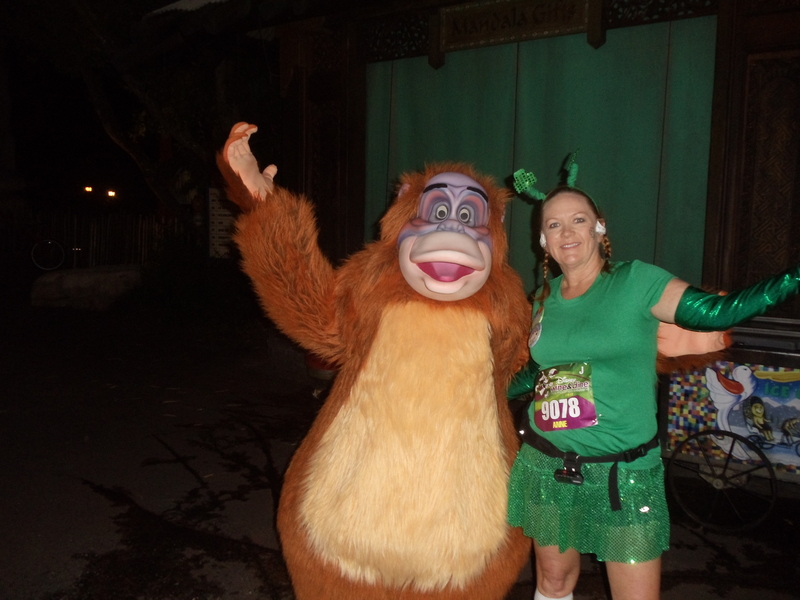 I participated in all but 2 of the 5K’s offered (at Tinkerbell and at the Disneyland Half) – someone might need to check my math/event count! 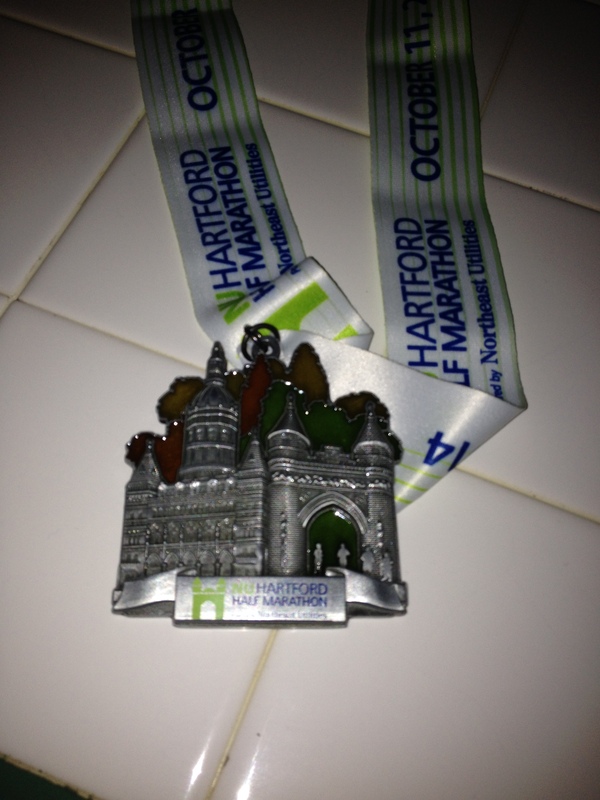 The Wine and Dine Half Marathon weekend was my last big event for the year. And since it was taking place the weekend before my birthday I invited a few friends along to help celebrate! 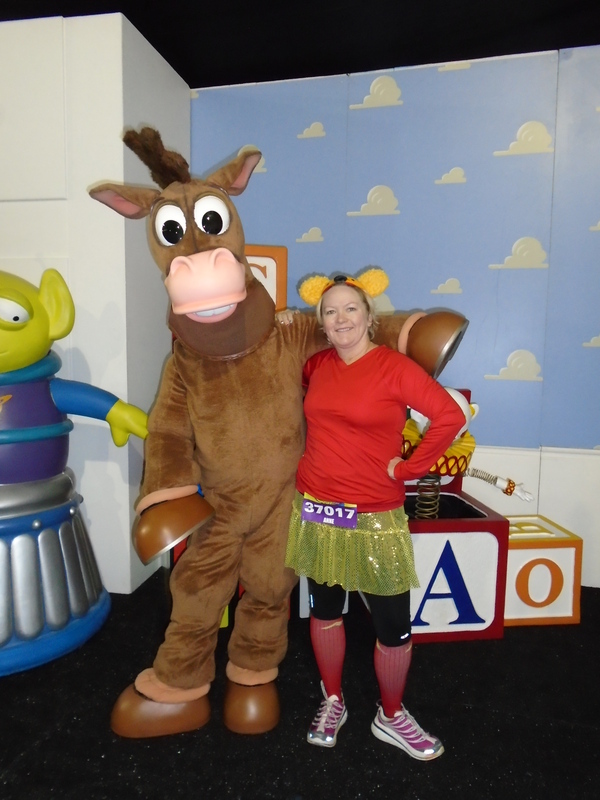 I was really pleased when two of them signed up to run the half marathon and one ran the Jingle Jungle 5K with me! The morning of the races, Jennifer and I finished up the 5K and went back to the villa to prepare for a long day of … laying by the pool 🙂 I tried to nap since I’d been up REALLY early (Jingle Jungle 5K) but that was pretty pointless. Mid-afternoon or so, we went to grab some dinner to bring to the room while getting ready. Of course, once we did that, time started FLYING! 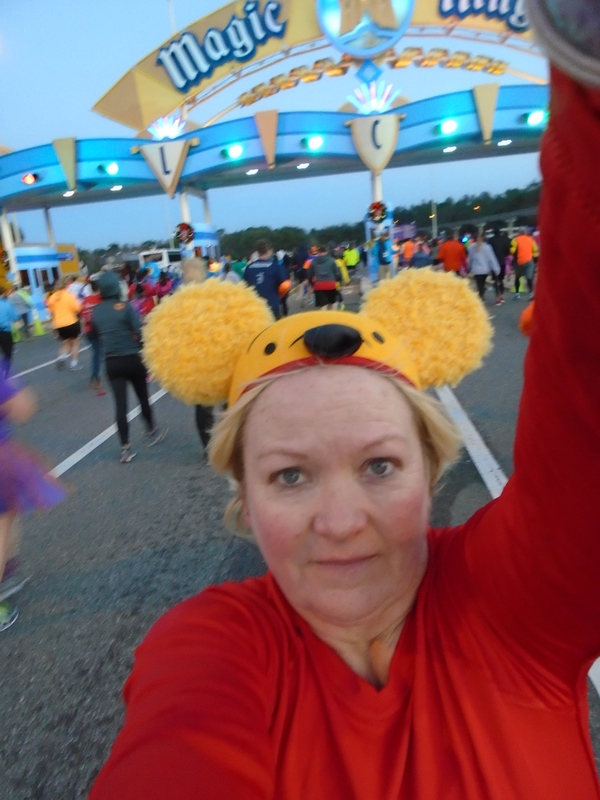 Earlier in the weekend, one of my half marathon running friends decided to not run, so Kathy and I headed for the buses pretty early (again, photo ops!) – and got to the starting area pretty early. 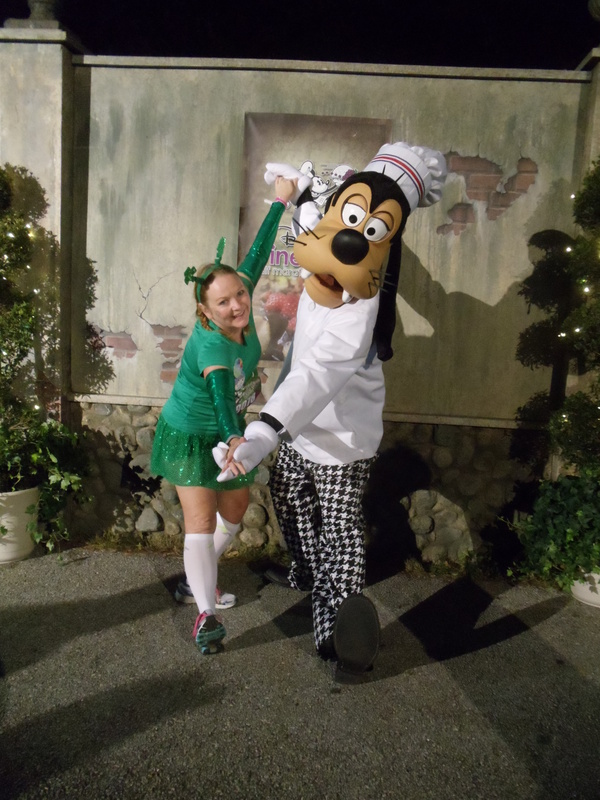 And hopped right in line to get a picture with my pal Goofy! Then we checked bags and hung out, dancing of course, until it was time to wait in line to potty before going to the corrals. 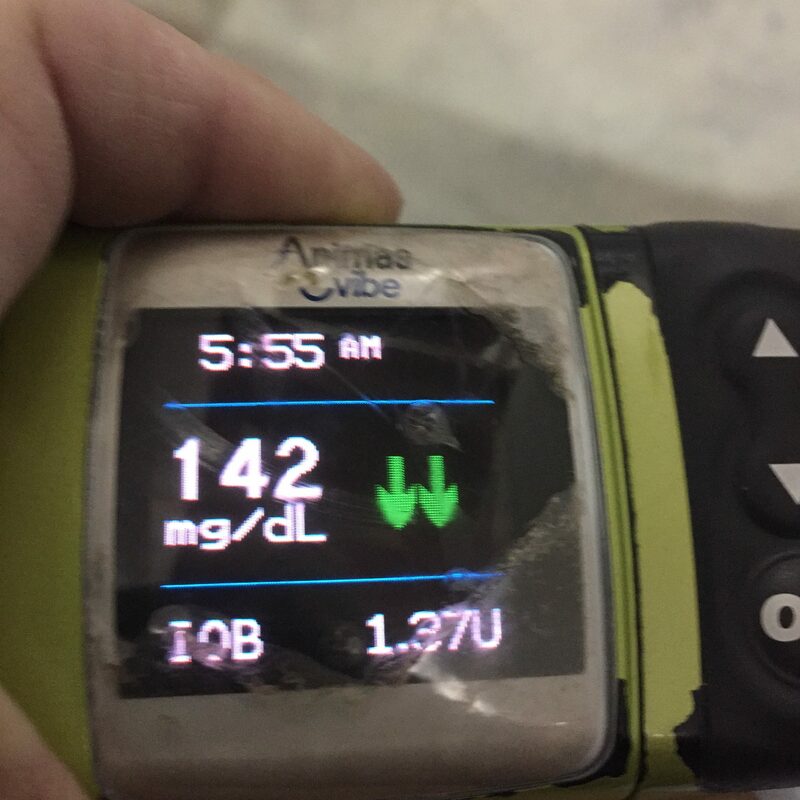 I met an amazing woman in my corral when I noticed her testing her blood sugar with the smallest meter I’ve ever seen! I learned that not only was she diabetic but she had also had heart surgery in September and was running her first half marathon! Dang. I really do feel like a slacker sometimes!! 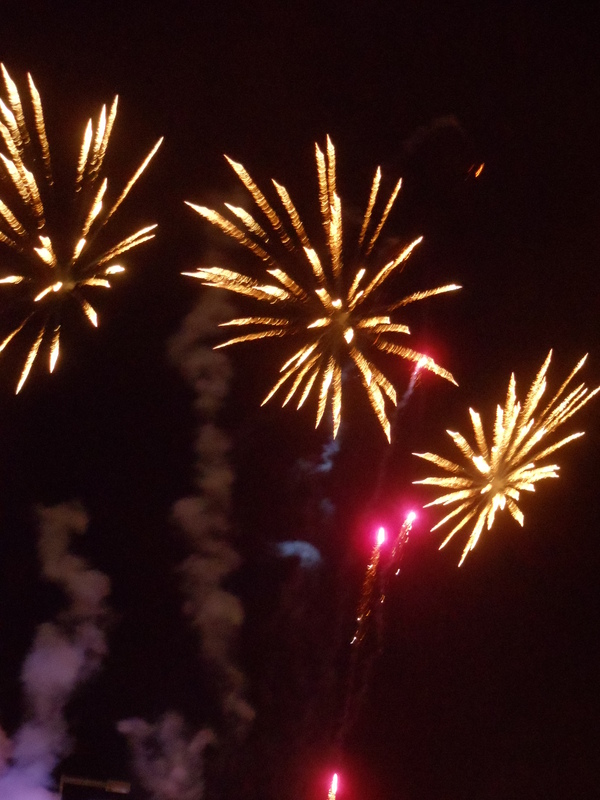 We slowly made our way to the start line, waiting for our turn at the fireworks and the big send-off. My plan was to stick to my intervals as much as possible and stop for pictures when so moved! Almost immediately I realized that as long as I was moving, even at a light jog, my glute/hamstring/entire freakin’ leg didn’t hurt so much. 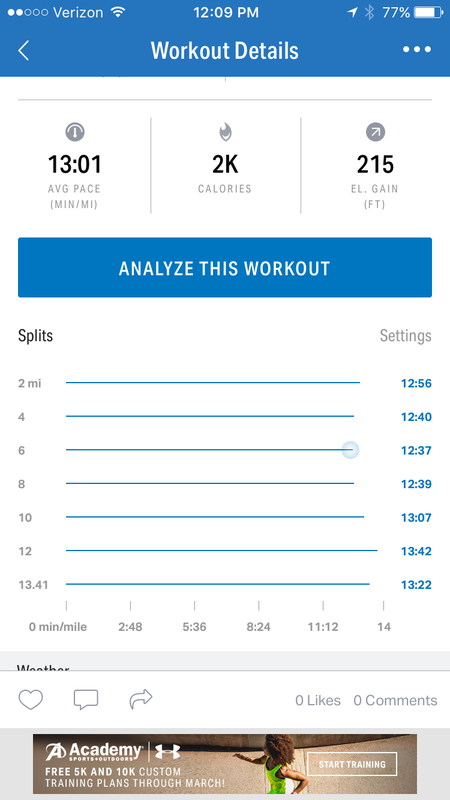 So I was definitely motivated to walk less – the transition from walking to running was really painful. 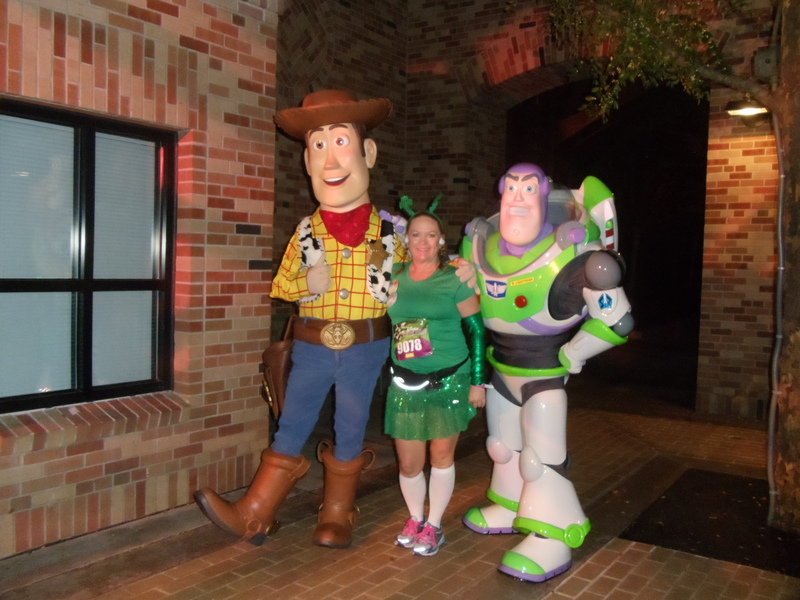 One of the great things about runDisney — each corral is special! I was really concerned that I wouldn’t make it to the finish – and I’ve never felt that in any race. But I was motivated thinking of all the people who couldn’t even walk 10 feet. 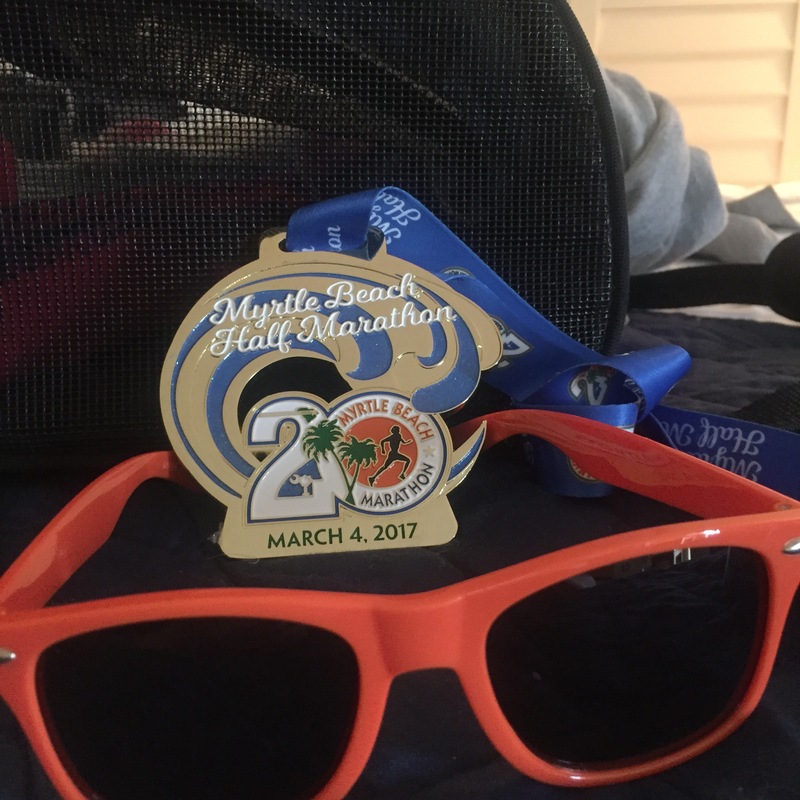 And, honestly, I was motivated by the bling – I couldn’t imagine coming this far to not add the last medal to my collection for the year! Just waiting for the final additions for the year…. I made some stops for character pictures – I was far enough back that there were few lines! I got some that I haven’t gotten before and missed out on a few favorites just because I knew that I couldn’t afford the wait in line! 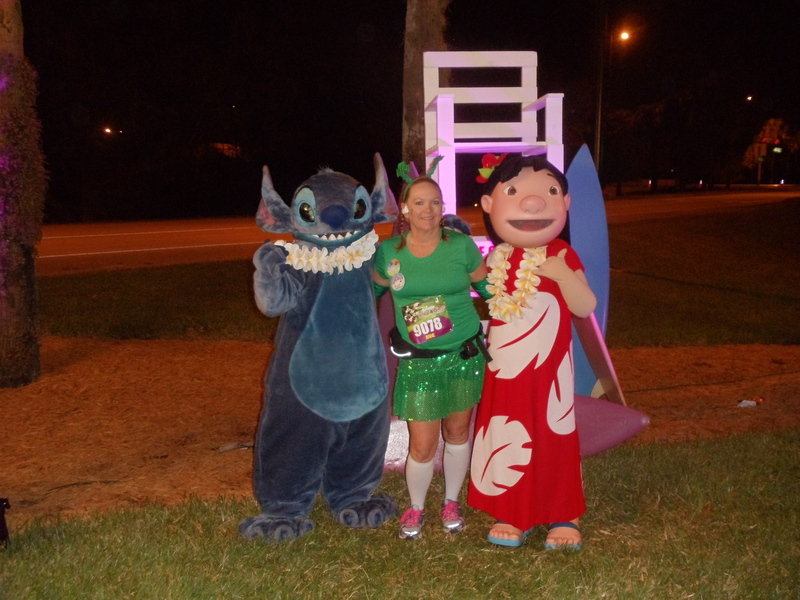 My first time with both Lilo AND Stitch! Hard to pass up these best friends! Wishing for some Incredible assistance to the end!! O.M.G.!! There they were. 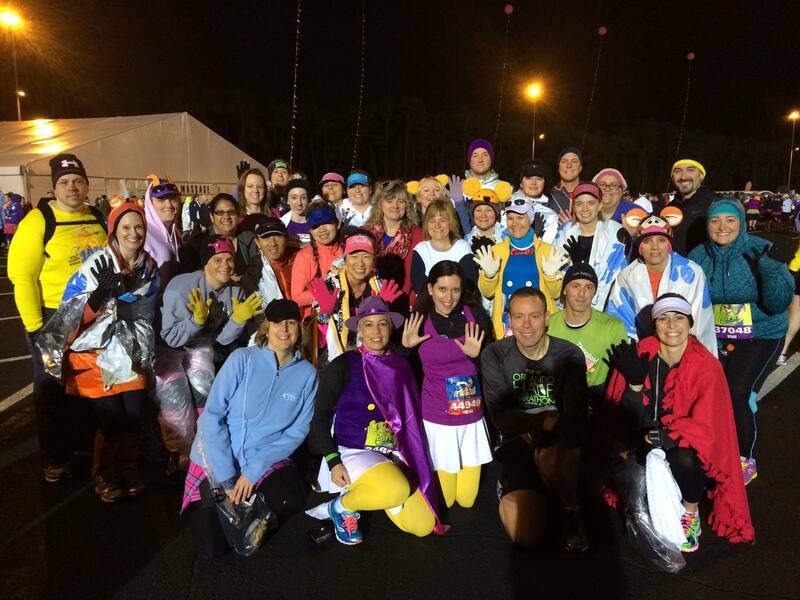 The infamous “balloon ladies” of runDisney fame!! That’ll sure light a fire under the slow! And, even while I was a little concerned, I couldn’t help but start laughing at the reactions around me – you would’ve thought Godzilla was approaching our tiny village!! 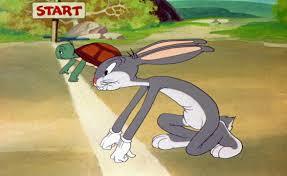 Slower runners yelling at the walkers to “Speed up or get out of the way!” and furtive glances backwards! When we exited the park the buses were just lined up, waiting to take away the unfortunate. Running into EPCOT the crowds were definitely picking up – runners and spectators everywhere! I knew that my friends were in there somewhere but I never saw them. As I exited EPCOT I can honestly say I have NEVER so much wanted to see a finish line so much!! And I gathered everything I had left in me because I was NOT walking across that line!! 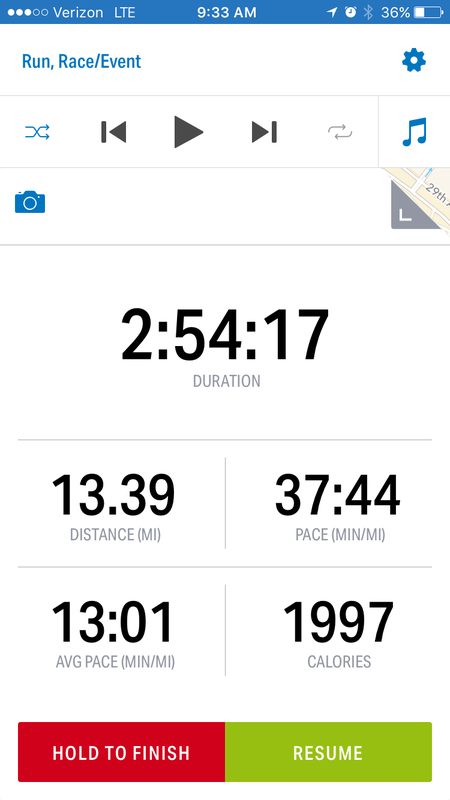 A quick glance at the clock told me that I had just finished my Worst Half-Marathon ever!! Time-wise that is. 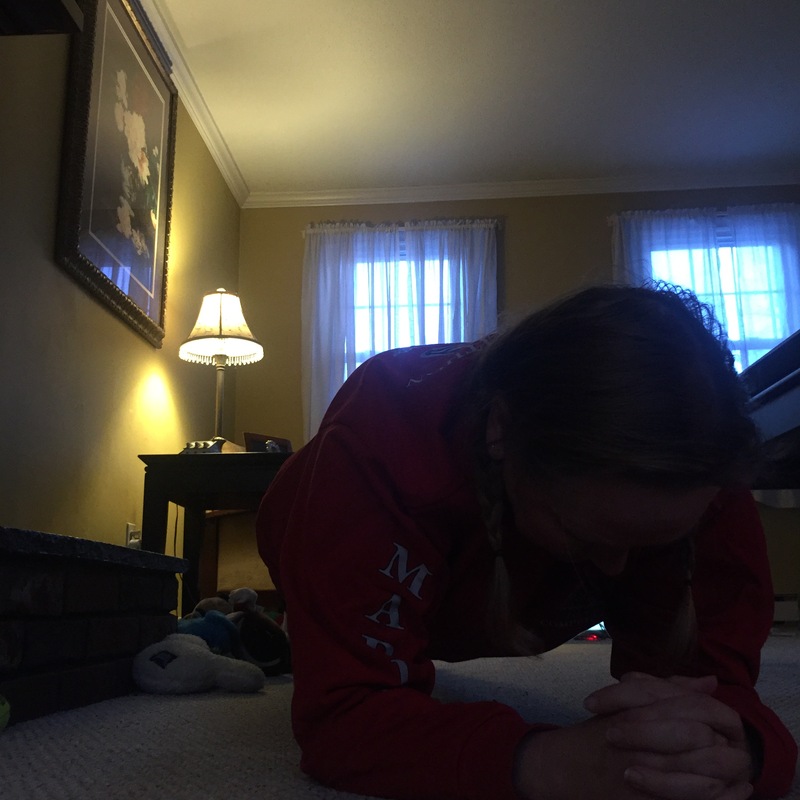 But that didn’t matter – I finished under my own steam and really felt like I earned every single medal I took home this year in those last few steps! Post-race meeting up with people was difficult as usual – this was only my second time this year that I was meeting people and my patience was pretty much non-existent! I grabbed an adult beverage that was offered to me, hugged a few strangers and started tracking down all my peeps! We eventually managed to hook up and made the decision to skip the after party as the crowd getting into the park looked pretty daunting. Along with a lot of other people we headed out to the bus and back to showers and sleep! 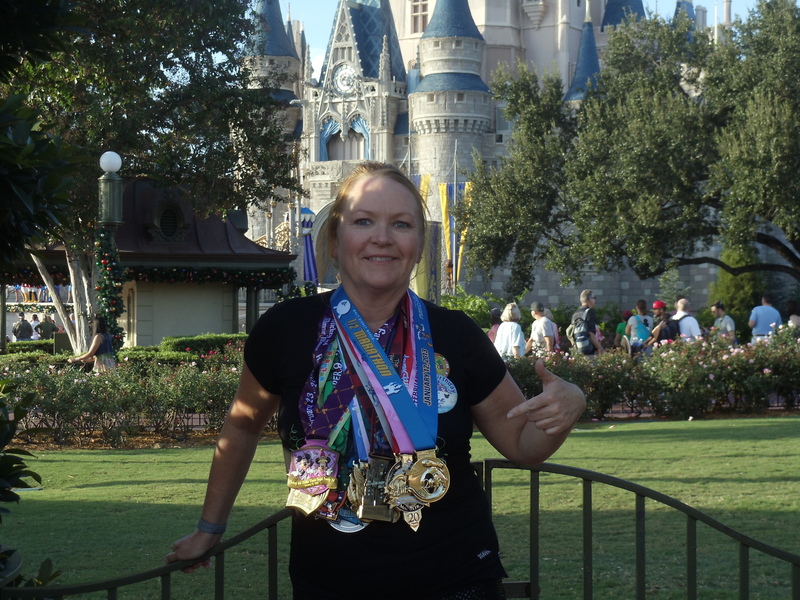 2014 brings the 5th Anniversary of the Wine and Dine Half Marathon and I’m thinking I need to go back to redeem myself!! 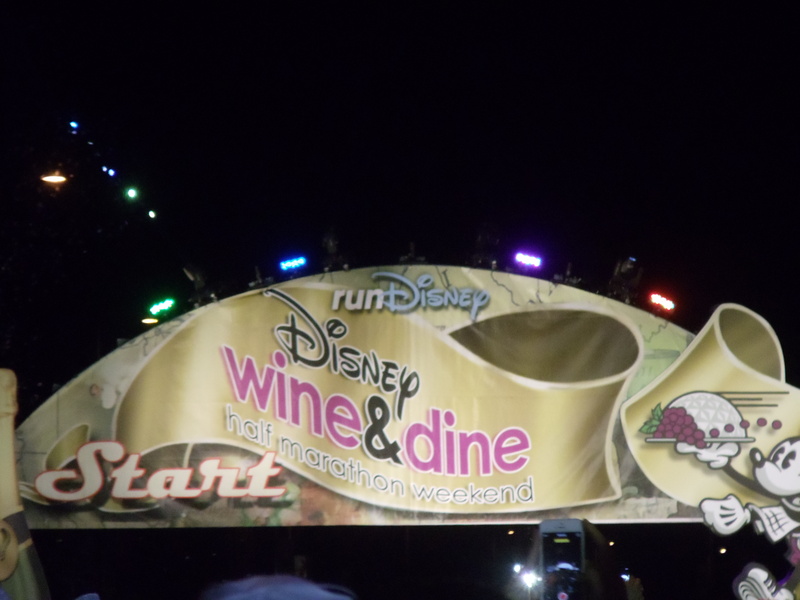 runDisney, Wine and Dine Half Marathon Weekend!!! 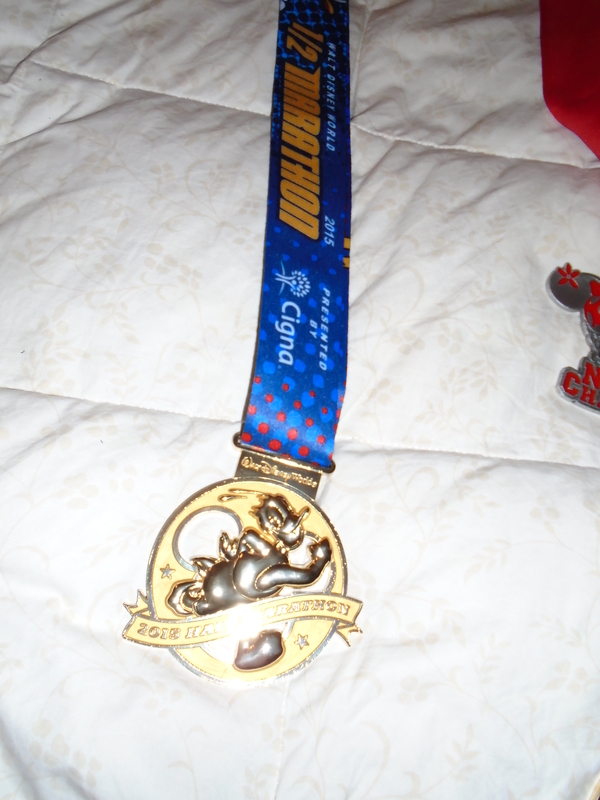 A little less than 11 months ago I was getting ready to run the Goofy Challenge at Walt Disney World. I got to The World on Wednesday morning – after unintentionally pullling an all-nighter. The plan was to check in and then hit a water park. Unfortunately when I arrived it was pretty cloudy and even a little drizzly, drippy rain. So I just headed over to one of the resort pools to relax. My sister-in-law and three of our friends would be getting in later in the day and since I had all the Keys to the Kingdom AND the MagicBands I needed to hang around. Once a few more girls arrived (girls? ladies? women? Eh…girls) and we grabbed a quick dinner before heading to the room. I was finally getting sleepy and really dropped off almost immediately!! After all, I had a big few days coming up!! and then we were off to the Magic Kingdom! We headed straight for Space Mountain which was closed (sad face) but Carousel of Progress is ALWAYS ready!! Made the rounds in the New Fantasyland and Storybook Circus – had to take a spin on Dumbo don’t ya know!! Then there was actually time to go back to Space Mountain and take a spin! The other girls headed off to see more of the Magic Kingdom and I headed back to our resort to meet my friend Christine who was driving from Sanford airport. 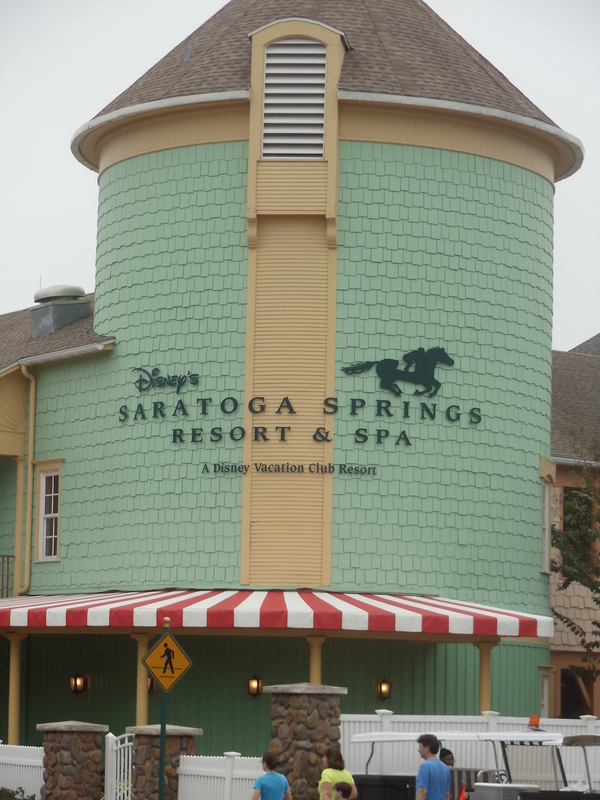 We had early dinner plans at Whispering Canyon Cafe at the Wilderness Lodge (ps, would LOVE to stay here one time!) so took a quick stroll over to Downtown Disney and wandered a bit before jumping on a bus to Wilderness Lodge. We ate the “family style” BBQ meal which was really good – so good that dessert had to come home with us! We called it an early night and now today I am ready to hit the expo – picking up bibs for everyone and need to actually do some shopping – there better be wine glasses and magnets left when I get there!!! 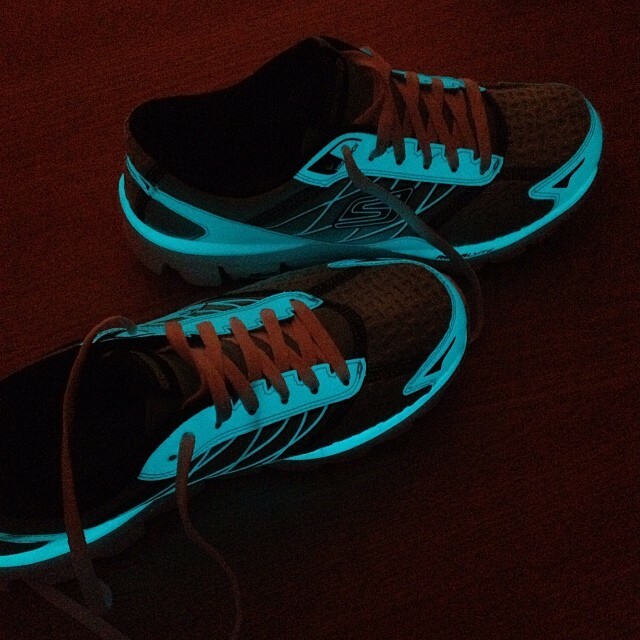 And I have some pre-puchased Sparkle Athletic goodies to pick up as well!! And today, the REAL picture taking starts!! !